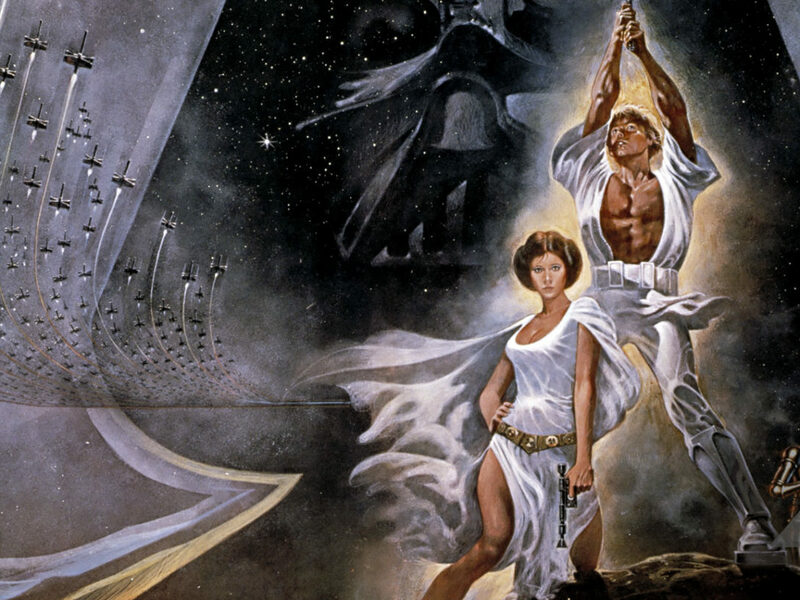 Learn all about one of the first -- and finest -- Star Wars fan collectibles. 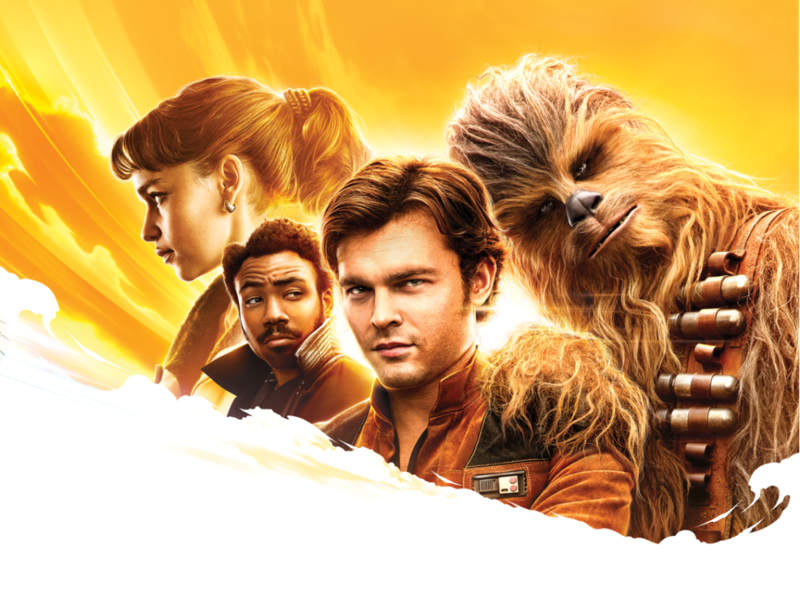 40 years later, Chewbacca looks great! 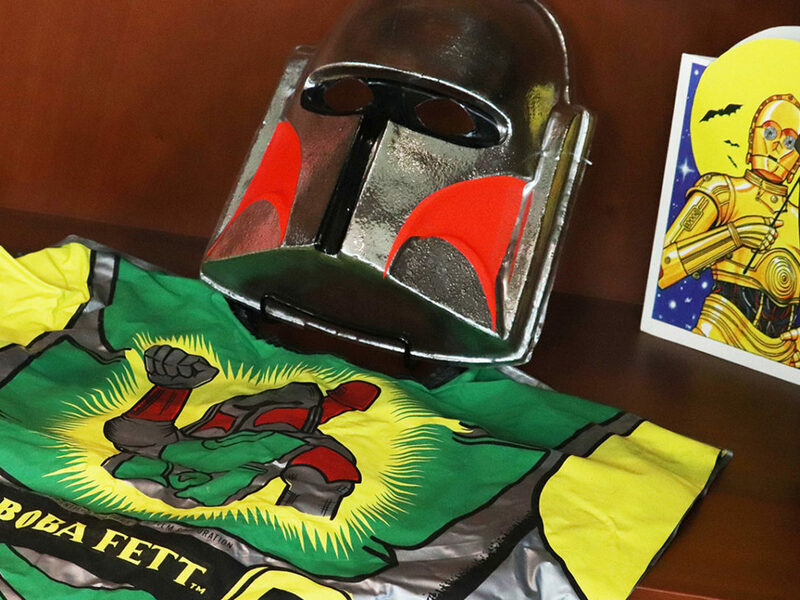 In the main lobby of Lucasfilm’s San Francisco headquarters, a small display of early memorabilia featuring Han Solo, Chewbacca and Lando Calrissian has been gathered to commemorate the return of the roguish trio in Solo: A Star Wars Story. 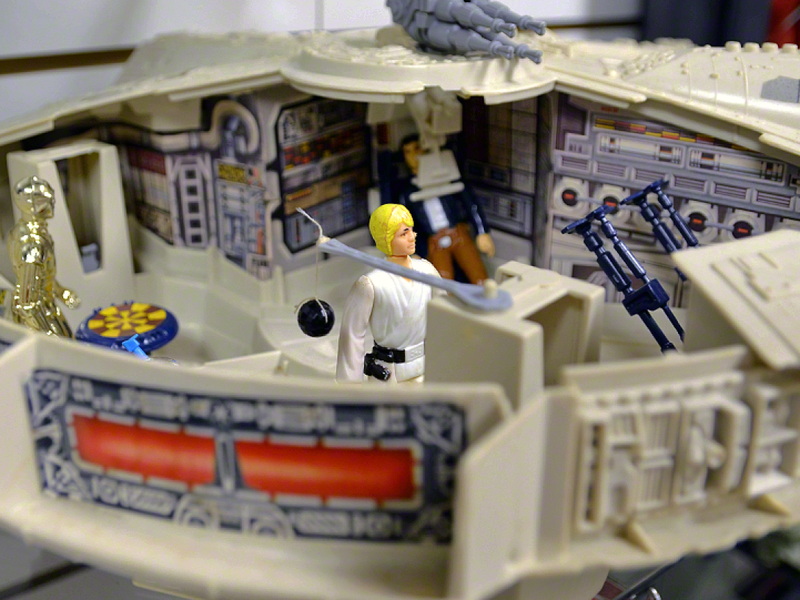 Tucked to one side of the display among the action figures, comic books and trading cards is a piece that ranks as one of the very first — and finest — items to ever grace Star Wars fans’ collections. 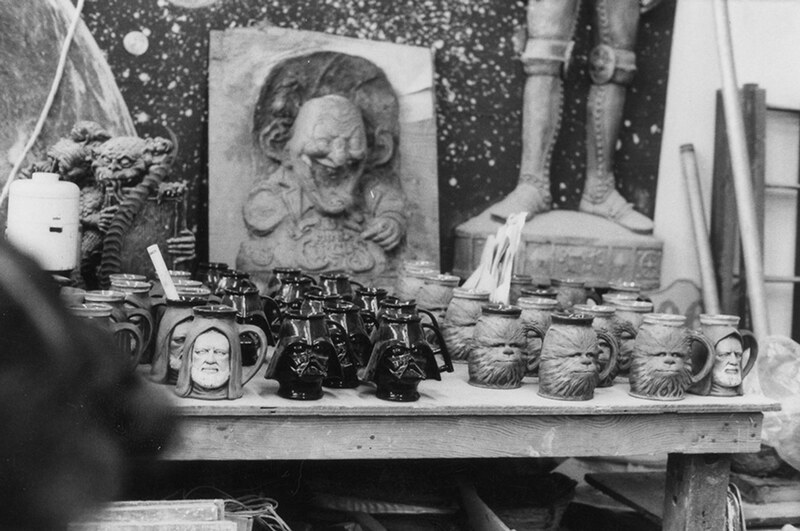 This early catalog photo of Rumph’s iconic Chewbacca tankard features an aqua-colored lip at the crown. Production versions were cobalt blue. 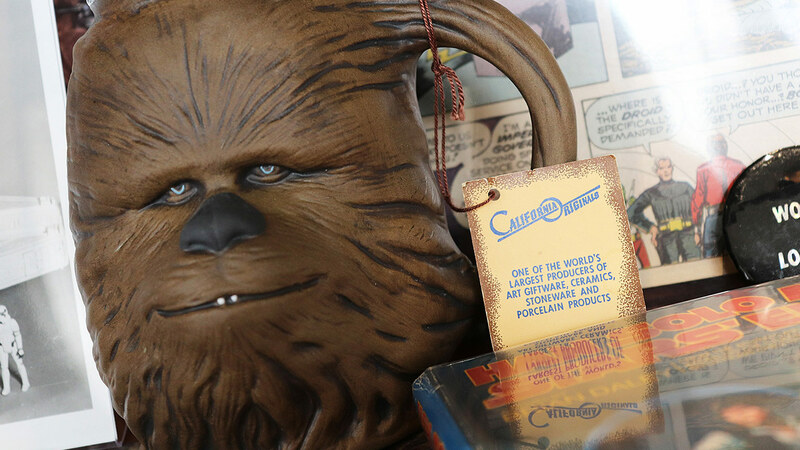 Released in early 1978, ahead of the iconic action figure line, the earthenware Chewbacca tankard sculpted by Jim Rumph and produced by California Originals is still considered a gem by both vintage and modern collectors alike. 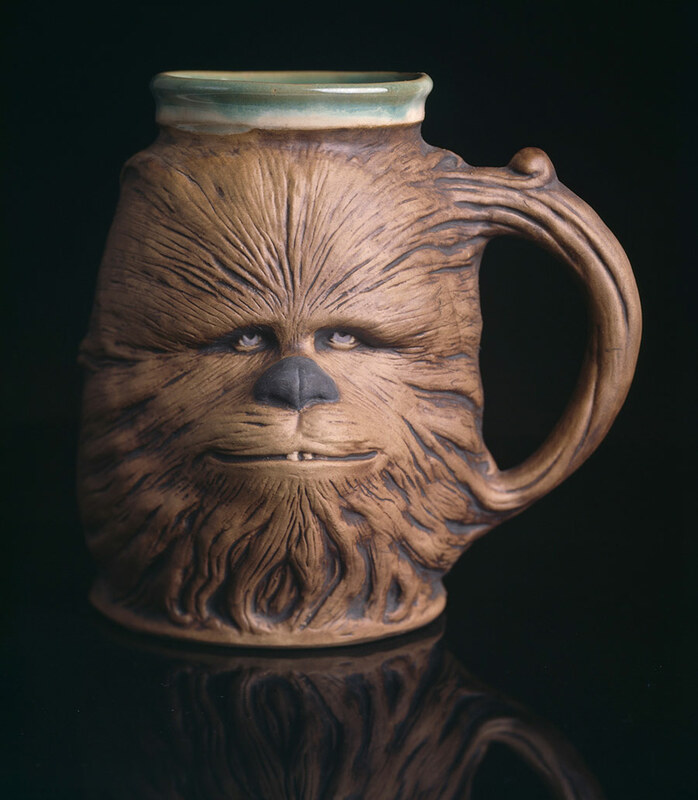 Adored for its artistry, quality and personality, the tankard (a term which by design evokes an “olde tyme” air) actually became an early favorite of George Lucas himself, who, according to Steve Sansweet’s From Concept to Screen to Collectible, often imagined a Wookiee mug sitting on his desk while he penned his epic space adventure. Jim Rumph at his Slyme Factory studio in Santa Monica, circa 1978. 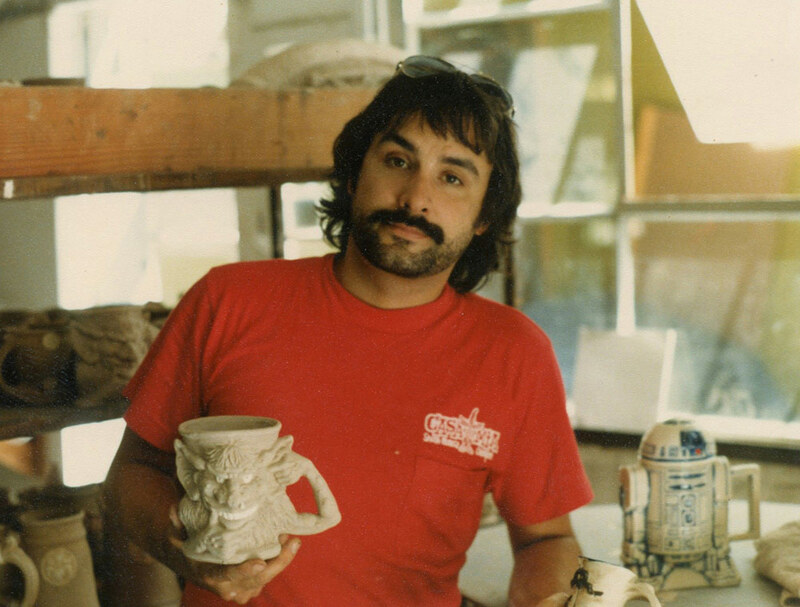 Note the unproduced R2-D2 tankard on the kiln behind him. Sculptor Jim Rumph, who passed away in 1993, was relatively well-known in the earthenware pottery community, and certainly to 1970s Renaissance fair-goers in Southern California who discovered all sorts of whimsical and grotesque creations populating his sales tent. A bit eccentric but vastly talented, Rumph was beloved by his many friends and most fondly remembered for his loud and contagious laugh. His company, Mind Circus, created scores of memorable pop culture ceramics, from King Kong tankards to E.T. piggy banks. It was within the whirlwind of creativity stirred up by the excitement of Star Wars that Rumph’s iconic Chewbacca tankard was born. 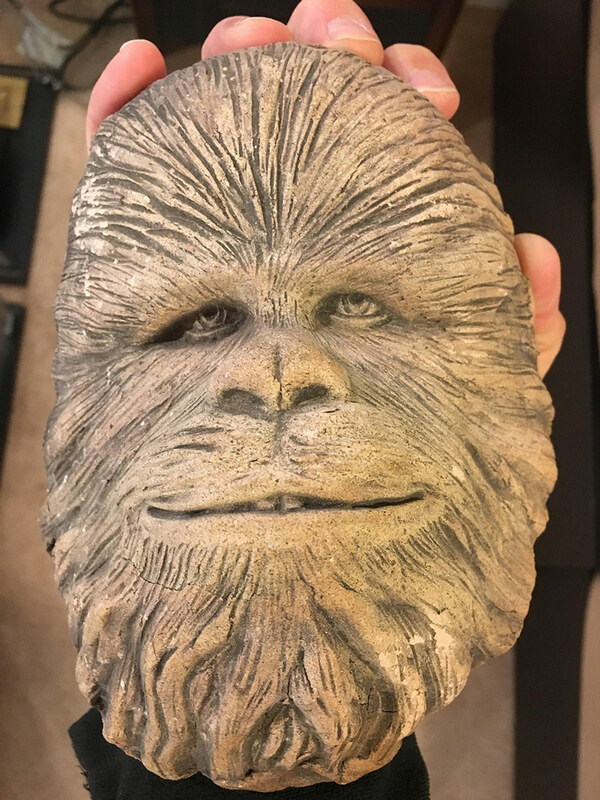 The original Chewbacca tankard face sculpture, held in the same way Rumph would have held it to sculpt. This rendition, as well as the early prototype tankards, were much larger than the final production versions. 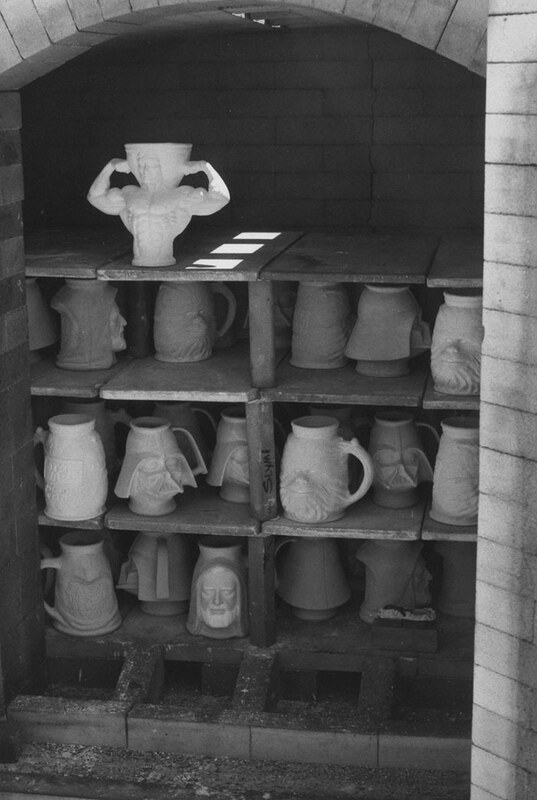 A rare photo of several Star Wars tankards in the kiln (Rumph’s 1978 Superman mug appears to be caught during his morning stretch). A mold was then made of the finished sculpture, and once cast, merged with the sculpted body of the mug itself and a handle added. A second mold would then be made of the entire mug sculpture, to be formed and fired at Rumph’s own Santa Monica studio, The Slyme Factory. 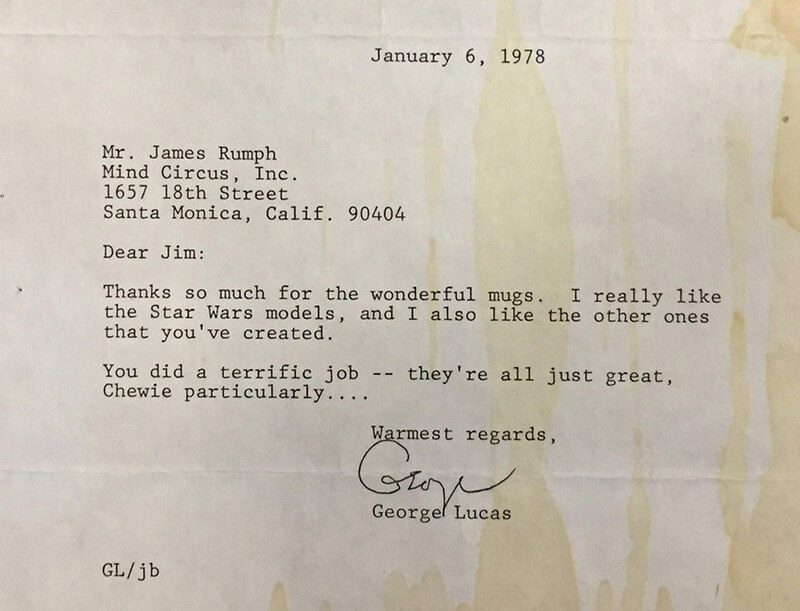 A letter from George Lucas dated January 6, 1978 thanking Rumph for the set of Star Wars tankards and singling out the Chewie version for specific praise. 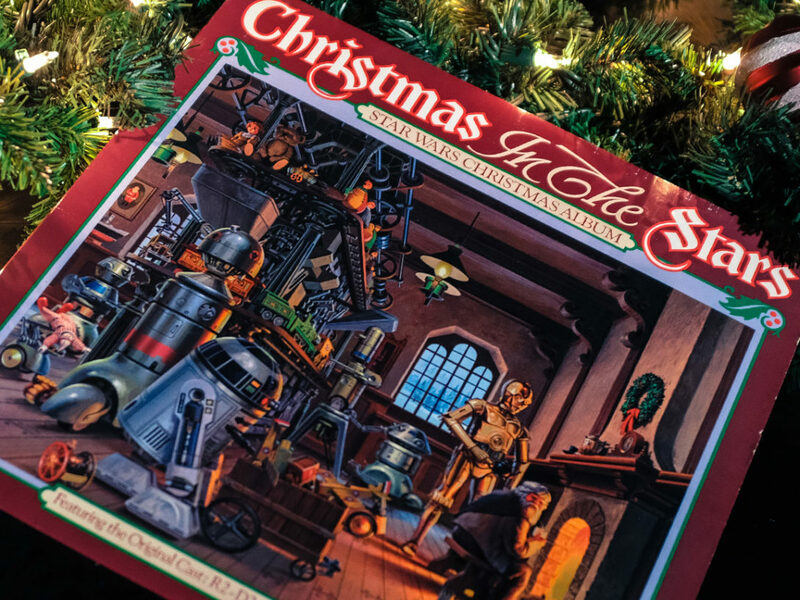 With the help of friend and then Lucasfilm director of fan relations Craig Miller, Rumph approached Star Wars Corporation in late 1977 to acquire a license to make the mugs, and sent Lucas a set of them as a gift around the same time. By January 1978, Lucas had responded that he very much appreciated the mugs, and particularly enjoyed the Chewbacca version. 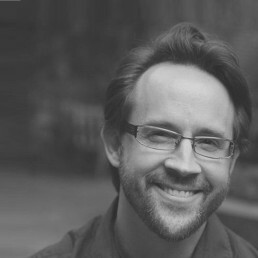 Within a week, Lucasfilm vice-president of marketing and merchandising Charley Lippincott granted Rumph a license to produce mugs of Chewbacca, Obi-Wan and Darth Vader, but rejected a proposal for a similar R2-D2 version with lid (according to the aforementioned From Concept to Screen, there was concern about the heavy lid pinching little fingers). Another rare photo of multiple Star Wars tankards appearing fresh out of the kiln at Slyme Factory. 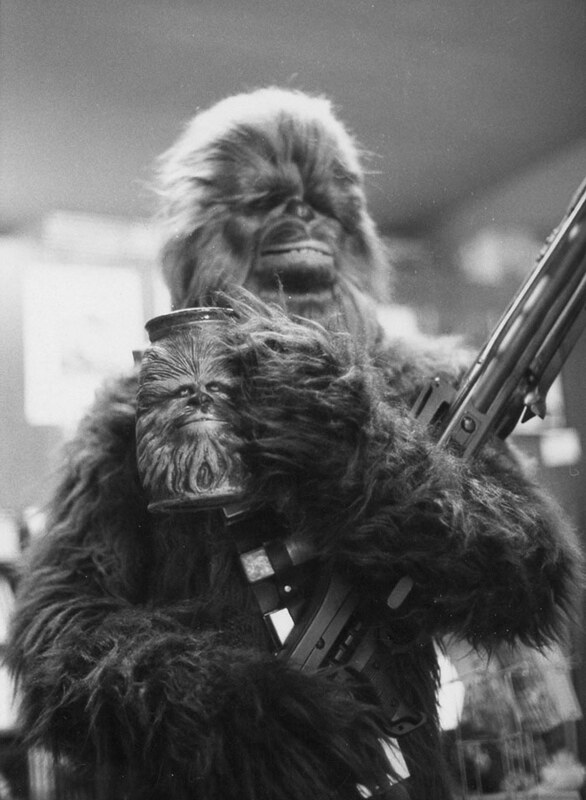 An early Chewbacca cosplayer holds one of Rumph’s Chewie mugs. When the trio of Rumph Star Wars tankards did reach market in the spring of 1978, it was initially as an American Express catalog exclusive. Soon, however, the mugs could be found in specialty shops and department stores, snatched up by shoppers who likely purchased them more for display than utilitarian use. By the first few months of 1979, it appears the Mind Circus license had expired and gone un-renewed, although Rumph did apparently consider doing a Yoda mug the following year after the character’s debut in The Empire Strikes Back. Sadly, however, the Rumph Yoda never made it into production. 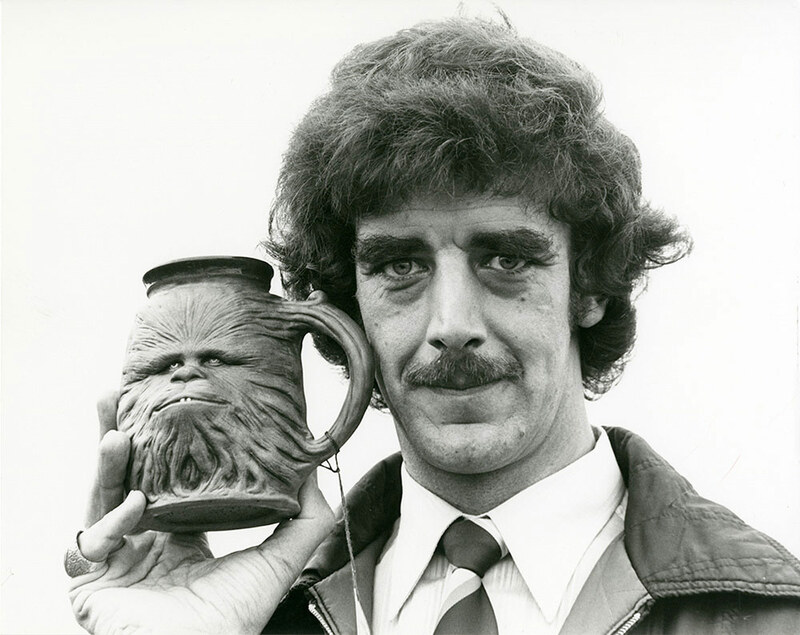 Chewbacca actor Peter Mayhew holds one of Rumph’s Chewie mugs at a 1978 equestrian event in England. 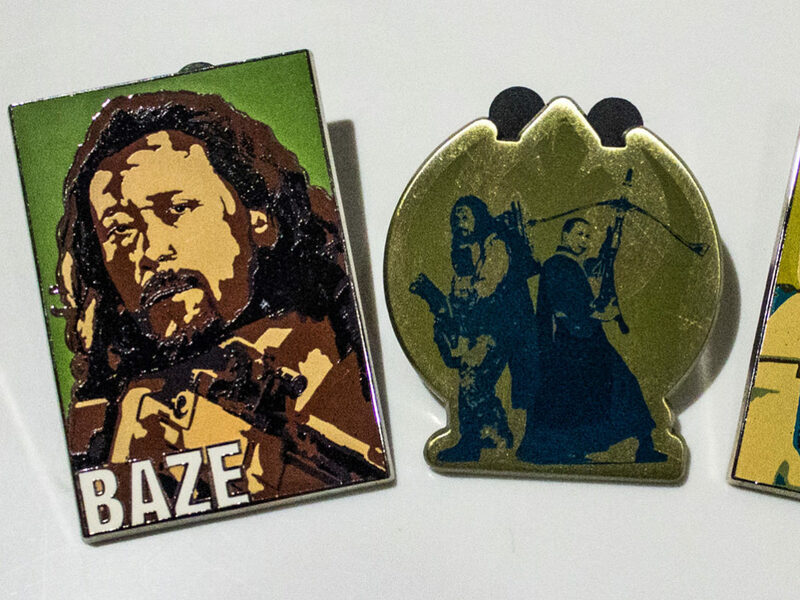 The mugs were given out as prizes or keepsakes at the event. 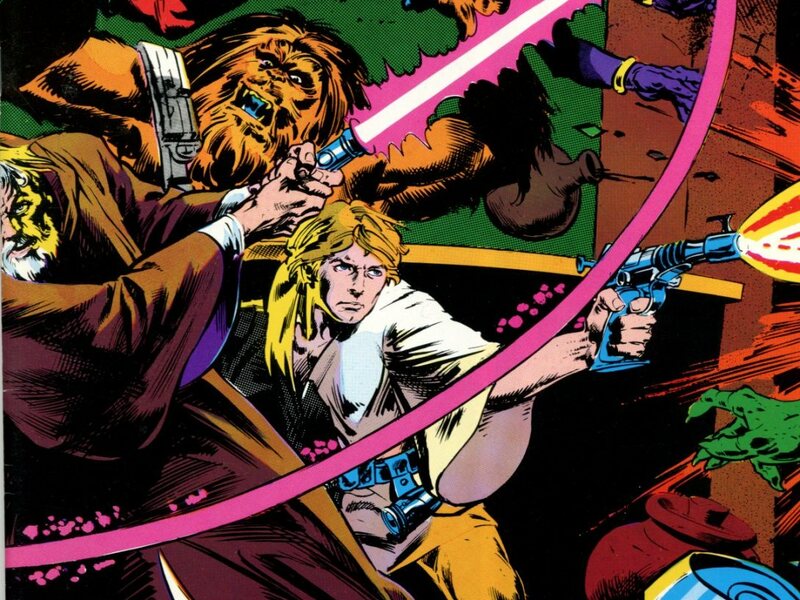 As a consequence, the Rumph name — as it associates to Star Wars — has been locked in a sort of time capsule with the first movie, giving it something of a rarefied esteem among collectors. Looking at the Chewbacca tankard among the other early artifacts on display in the Lucasfilm lobby, it’s unclear if any of the other pieces really measure up to the quiet prestige of Rumph’s iconic sculpture — fitting, it would seem, since we all know it’s not wise to upstage a Wookiee. Images and artifacts compiled for this article from the collections of Gus Lopez, Will Grief and the author. Special thanks to Estelle Rumph, Craig Miller and Charley Lippincott for providing additional information and context.